This is my third Christmas not really being able to afford Christmas presents for everyone. Two years ago, every dollar I made went toward paying for our wedding. Then last year, we were still recovering from the wedding, plus adjusting to our new life together and money was so tight, we didn't really do gifts for our families at all. That made me really sad. :( Not that I like to go all out, but giving gifts is fun! This year, I found a happy medium! 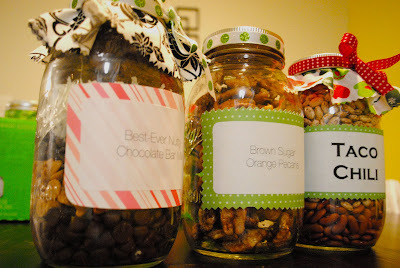 Homemade Christmas gifts! And, I don't think they're cheesy at all. 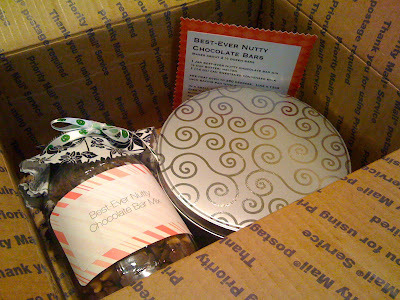 I would love to get a package like this in the mail! 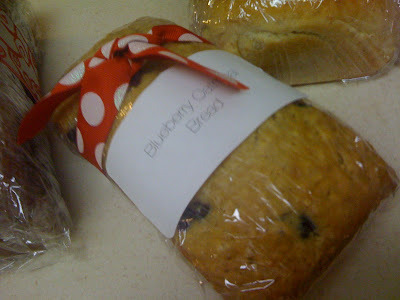 I've been sending baked goods for a few years, but this year, it's to a whole new level! 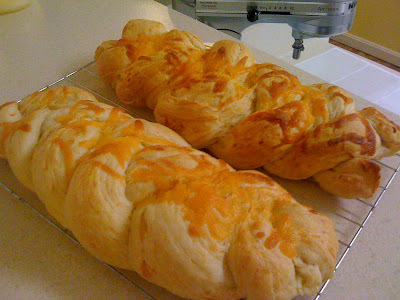 I saw this idea in a Paula Deen magazine. 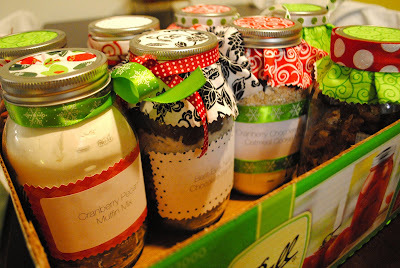 Jar mixes! 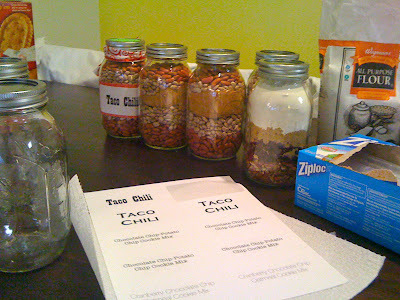 I measured out the ingredients for a few different foods and portioned them into mason jars. I printed labels. It was fun! And easy. 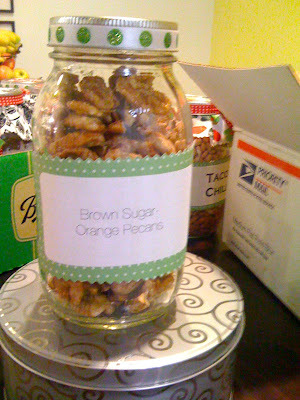 My idea was to send a jar mix, some cookies and some freshly baked bread to our family members. 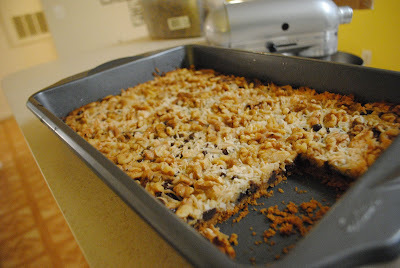 Then... my oven broke!! Seriously. It stopped heating. So again, my attempt at mass amounts of baking failed. So, the jar mixes just sat and waited for the other stuff. It was at this point that I had to come to terms with the fact that I was not going to be able to get this stuff to peoples' houses by Christmas Day. Oh well. I tried. 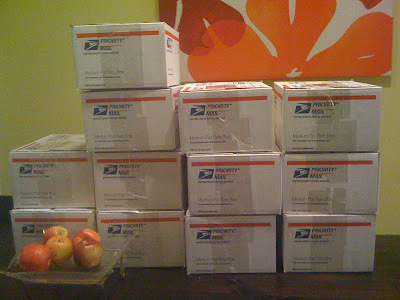 There was no way I was going to be able to get 12 Priority Mail boxes home anyway. Post Offices are only open when I'm at work. And I did not see myself trying to carry 12 boxes home on the Metro. 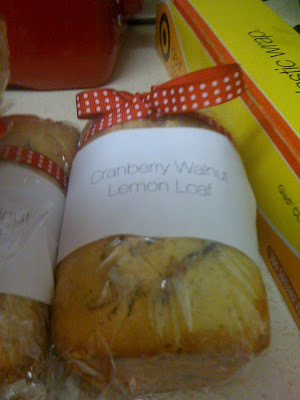 So, the mass baking had to wait until yesterday. That's when I caught up!! 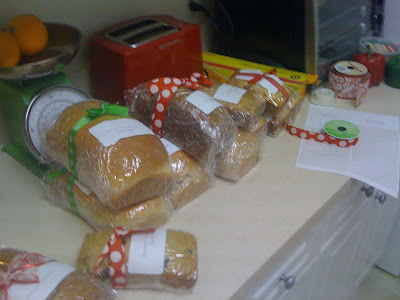 I made 12 LOAVES OF BREAD yesterday! Honey Whole Wheat, Pumpkin, Pumpkin Cinnamon Swirl, Cinnamon Oatmeal, Blueberry Oatmeal, Braided Cheddar Bread, Banana Nut bread and gosh, I can't even remember what else... but it definitely looked like bake sale headquarters up in here! 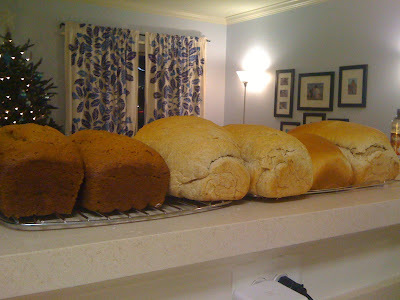 I get almost all my bread recipes from The Frugal Girl. Yum. After 8 loaves, I ran out of eggs so I made an emergency run across the street to Target. In my PJ pants. I realized upon arrival that I was at Target, wearing flannel pants with Christmas trees on them and it was like 6:30pm. I prayed I wouldn't see anyone I know. Which is a real problem since we moved, we see people from church all the time there! God heard my prayer. 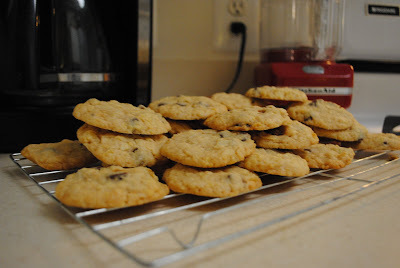 I came back home and finished up baking. Michael and I tag teamed. He did all the click-and-ship stuff on the Postal Service website. I'm super glad he did because that kind of administrative stuff drives me nuts. I have no patience. He printed the labels too, yeah! At about midnight, we were DONE! Carl, our mail man, came and took all these boxes away today. So family, sorry you have to wait, but I promise it will be worth it!